1. 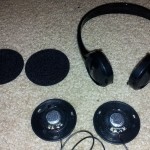 Disassemble the headphones. The foam pieces can be pulled off easily. 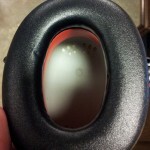 After that carefully insert the tip of a knife or screwdriver between the back of the speaker grille and the headband, near one of the three plastic taps. It should snap off easily with a little prying. 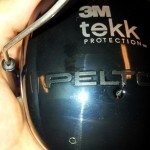 Be careful not to damage the wires or the plastic grille pieces. The headband and foam pieces can be discarded. 3. 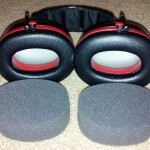 Remove the foam inserts from the earmuffs. They pull out easily and there is no glue or anything holding them in place. 4. 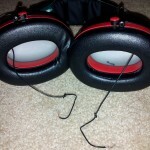 Drill a small hole in each earmuff for the wires. The wires are small so used a 1/8″ bit (3/32″ might be large enough). There were some small indentations on the inside of the muffs, so I used them as a guide. This helped me place them in identical locations on each side for a nice, even look. I drilled the holes first from the inside and then again from the outside to clean up the holes. Be sure to remove all of the debris afterward. 5. Untie the knots on the wires, pass them through the holes, and tie new knots a bit further up the wire. The knots provide strain relief and keep the wires from being ripped from the headphones. 6. Solder the wires back onto the speakers. If you are particular about this, you can use de-soldering braid to remove to old solder and replace it with your own. There is plenty of solder there already, though, and the wires are small so it is easy enough just to melt the wire into the existing bead. 7. Carefully reinsert the foam pieces into the earmuffs. Be careful not to put a lot of strain on the wires or solder connections. 8. Tuck the speakers between the foam and red plastic frame. I started mine in the middle and then slid them down to the bottom. 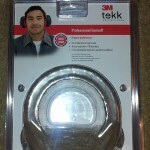 The pressure from the foam holds them snugly in place without the need for any adhesive. 9. Optionally seal the outside holes with hot glue. 10. Enjoy the music and spare your hearing. Jason, these look great. One quick question. 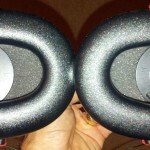 Did you have to cut away any of the foam in the headset to accommodate the new speakers? No cutting was required. That’s what I like about this combination of components. The foam is left intact and the pressure from the foam holds the speakers firmly in place. Thanks for the comment!